Last week, the Chicago Blackhawks and the St Louis Blues unveiled the uniforms they’ll be wearing at the upcoming 2017 Winter Classic on January 2, 2017 at Busch Stadium in St Louis. 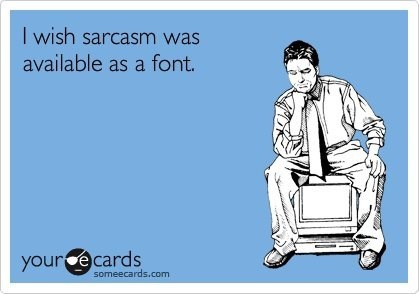 One was overwhelmingly great, the other was just…well…underwhelming. And we’ll start with the latter. 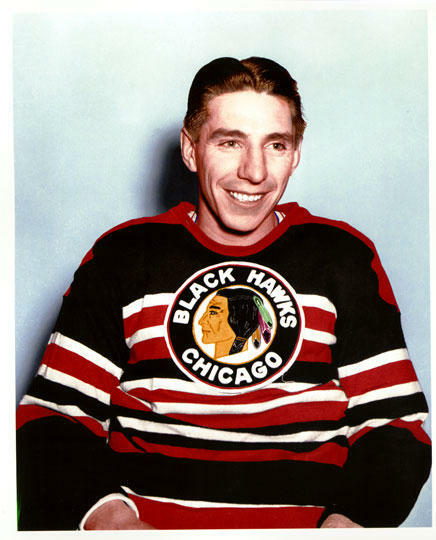 Seriously, the Blackhawks’ designers are getting bored with these outdoor jerseys, aren’t they? Playing in what will be their fifth outdoor game (and third Winter Classic), and their fourth outdoor game in four years, the Blackhawks seem to have just given up on doing anything of note for these specialty jerseys. 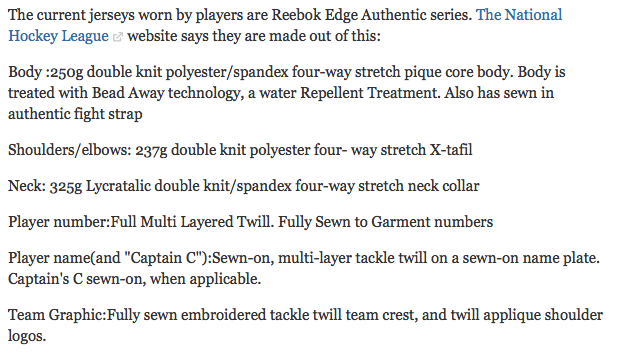 Which is disappointing considering the pretty unusual and eccentric collection of jerseys they’ve worn in their past. Why not go for a super-striped jersey, especially for something like the Winter Classic? 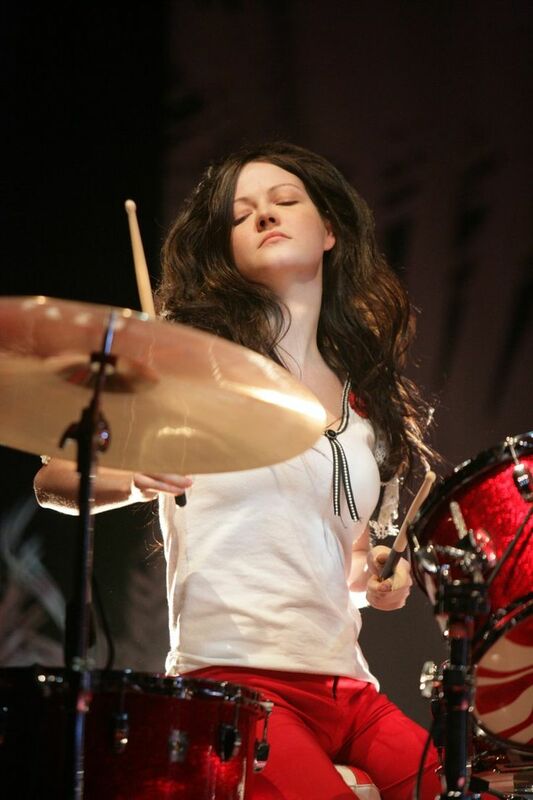 Or, go full black-and-white with beige pants. For a one-off game, why not? 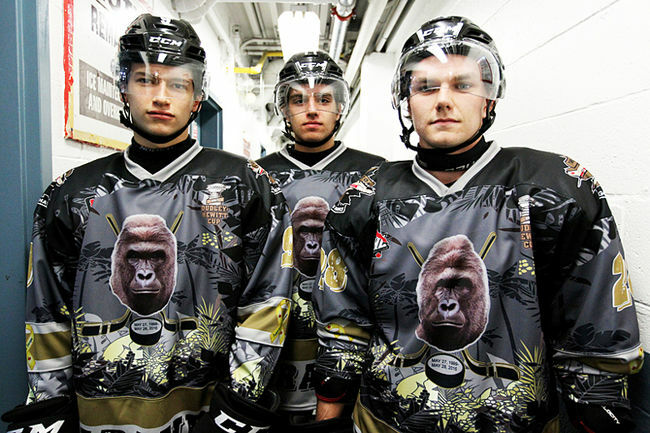 Or, even just a goddamn Harambe jersey. Just do something! The jerseys they’ll be wearing in January look oddly familiar, because they something extremely similar 2 years ago, at the 2015 Winter Classic. Oh, and they also wear something extremely similar in 41 of their 82 games every season for the past 50+ years. The differences between these three jerseys are extremely minimal. Compared to their road jersey, the 2015 Winter Classic jersey has thinner non-outlined numbers, no stripes on the collar, laces, and a red/white alternate logo over the sleeve stripes. 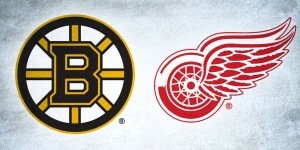 The differences made to the 2017 Winter Classic is an historic logo and added some colour back to the alternate logo. And that’s it. Bravo! 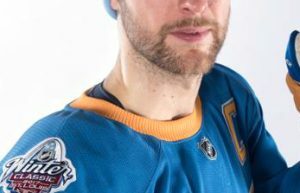 So, if you read the above link, from their last Winter Classic jersey, you’ll get the gist of what we think of this one. So, the one major change is the logo that’s in the middle of the jersey, using the version that they original wore from 1957–65. 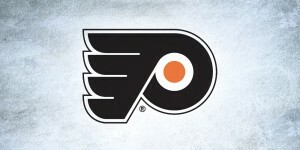 From a conceptual standpoint, it’s exactly the same as their current logo, but just less refined. The feathers are more complicated, as are the lines in the hair (which, in this case, looks more like random scribbles than anything). The skin tone is also noticeably lighter, which doesn’t strike me as problematic in and of itself. Whenever you’re dealing with a caricature of a specific ethnicity, you have to tread lightly (Hello Redskins! Hello Indians! Hello old Blackhawks logo! ), but I don’t see this version’s particular skin tone as being an issue. And I like the historicity of it. Yeah, it’s a jersey based on what’s already one of the best road jerseys in the league, so it’s still a great, elegant jersey. But damn, the lack of innovation (or seemingly any desire to make something worth buying) is such a buzzkill for it. And maybe because the Blackhawks have been so good for so long now, they don’t care about making money through jersey sales? No idea, but either way, you’re killing my vibe. 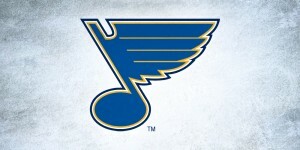 After years of wandering through the Siberia of jersey design, the St Louis Blues are finally getting it together. 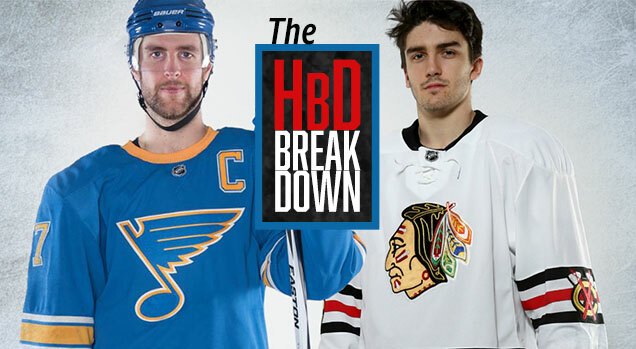 First, their revamped home-and-away jersey set is a fantastic combination of innovation, historicity and just keeping what has always worked and throwing away what didn’t. And now, with their first chance to display their skills in an outdoor game, they hit it out of the park. 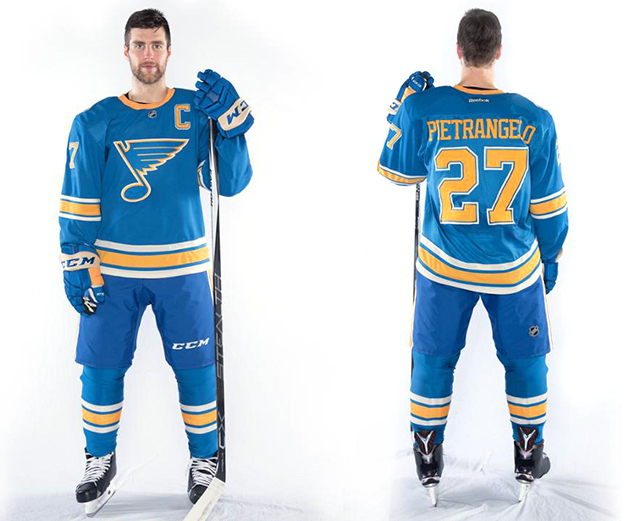 It’s also the Blues’ 50th anniversary this year, so they went back into their jersey library and resurrected something very similar to their original 1967–73 blue jerseys, albeit with a few very minor differences. The biggest thing that makes this jersey look historic is the ribbed collar. The Habs did something similar for last year’s Winter Classic jerseys, wearing a crewneck instead of the standard v-neck collar. (The Bruins did too last year, but with a black collar on a black jersey, it wasn’t as noticeable.) 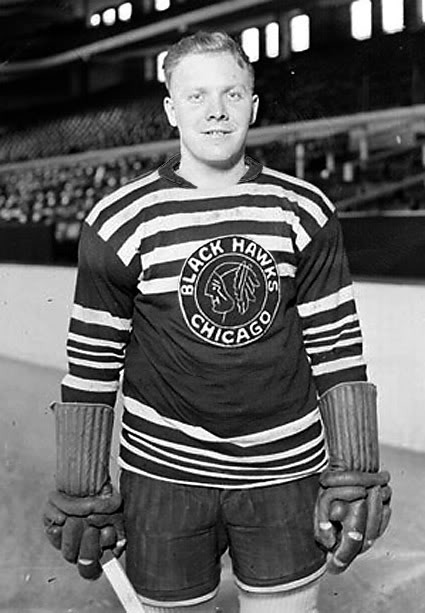 Historically, and in general hockey vernacular, the hockey jersey is sometimes also called a sweater, even though today’s design and materials are anything but sweater-like. 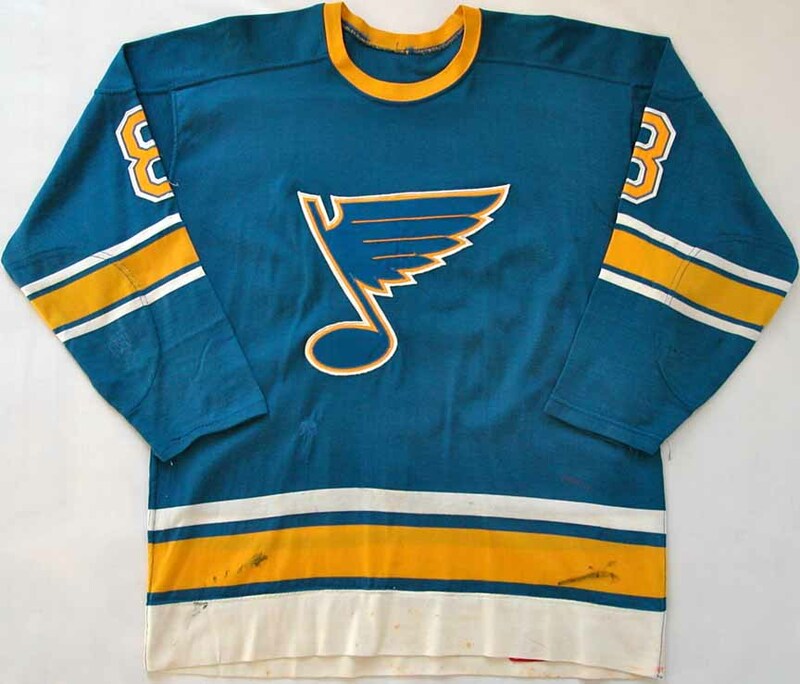 But as soon as you see that crew neck on the Blues’ jersey (especially when seen in combination with a pom-pom-laden touque), you can’t help but think of it as a sweater. It’s symbolic of classic old-school hockey jersey aesthetics. And it makes the jersey instantly look authentically old. In a good way. The other thing that immediately sticks out is the colours of the jersey. 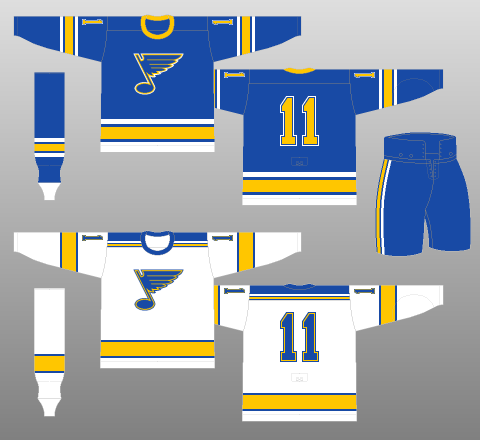 The current Blues jerseys use two tones of blue – a royal blue and a darker navy blue – both of which are noticeably darker than the blue tone used on this Winter Classic jersey, which can be best described as a dark baby blue. And it’s wonderful. It’s hard to tell from what can be found online how close this blue is to the original 1967 jerseys, but these seem to be pretty equivalent. And, of course, there’s only one tone, with the Blues’ logo (which is awesome by the way) the same colour as the rest of the jersey. It’s a minor difference from their current jerseys – which always has the navy note on the blue jerseys – but it also adds to the historical aesthetic of the jersey. 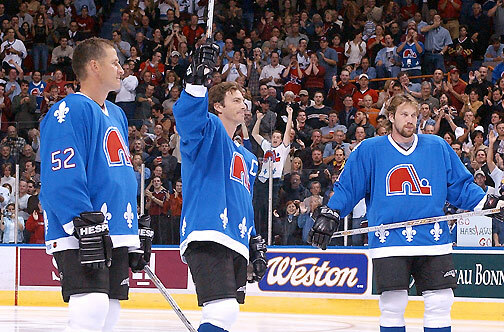 Plus, it’s a unique blue within the league, not seen since the days of the Nordiques. In a league that’s inundated with navy blue so dark it’s almost black, it’s incredibly refreshing to see a blue that stands out from the crowd. The jersey’s striping is where it deviates from St Louis’ original 1967 jerseys most obviously, namely at the bottom of the jerseys. The original jersey has the lower white stripe go all the bottom edge of the jersey, while the Winter Classic jersey keeps it as a stripe, consistent in size with the upper white stripe. This is because, presumably, the old jerseys had a straight hem on the bottom, while the new jerseys are rounded in the back. And since they were going with blue pants, a curved white stripe would look awkward. It was the right decision. The sleeves are pretty much identical to the originals. My only complaint about the jersey’s stripes are that they’re slightly inconsistent, with the white stripes on the sleeve being thinner than the ones along the bottom. But that’s a pretty minor criticism. Love it. The striping is classic old-school aesthetics. The colours are fantastic. The collar makes gives it old-school authenticity. And the logo is awesome, as always. For a one-off historic jersey, it hits all the right notes.